Find Out how Your Diet can Cause Cavities Why do wisdom teeth need to be removed? Oral cancer is largely viewed as a disease that affects those over the age of 40, but it can affect all ages, even non-tobacco and alcohol users. Oral cancer can occur on the lips, gums, tongue, inside lining of the cheeks, roof of the mouth, and the floor of the mouth. Our team at McCreary Family Dentistry recently put together some facts and figures to illustrate the importance of visiting our Pensacola, FL office. Our friends at the American Cancer Society recommend an oral cancer screening exam every three years for people over the age of 20 and annually for those over age 40. Because early detection can improve the chance of successful treatment, be sure to ask Dr. James McCreary and our team to conduct an oral exam during your next visit to our Pensacola, FL office. 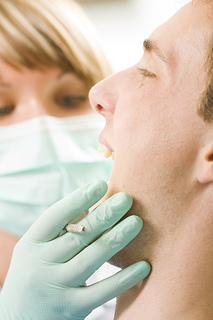 Cancer can affect any part of the oral cavity, including the lip, tongue, mouth, and throat. Through visual inspection, Dr. James McCreary and our team at McCreary Family Dentistry can often detect premalignant abnormalities and cancer at an early stage, when treatment is both less extensive and more successful.